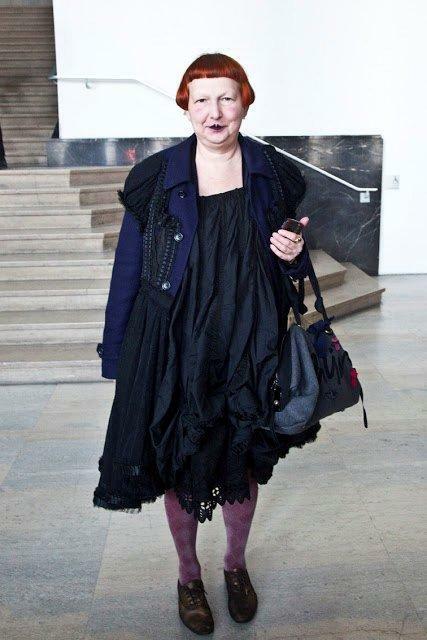 Lynn Yaeger is a contributing fashion editor to Vogue.com and a contributing writer to Vogue. 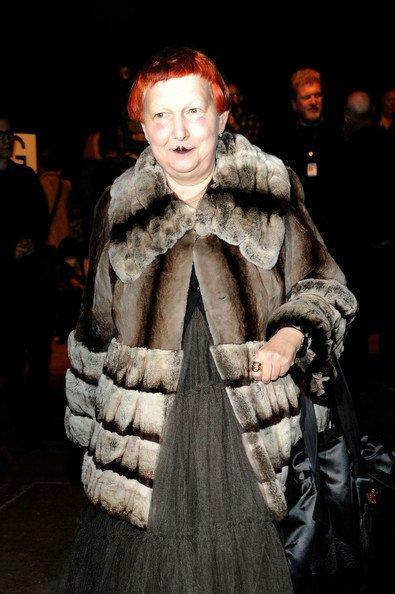 She is a former fashion reporter for The Village Voice, having worked for the paper for 30 years. Her column, “Elements of Style”, was renamed “Frock Star” in February 2007. Yaeger is also a regular contributor to The New York Times, Style Magazine, American Vogue, Travel & Leisure, and countless antiques & collectibles dealers. Lynn is also a fashion columnist for Full Frontal Fashion, a style website in association with Sundance Channel. 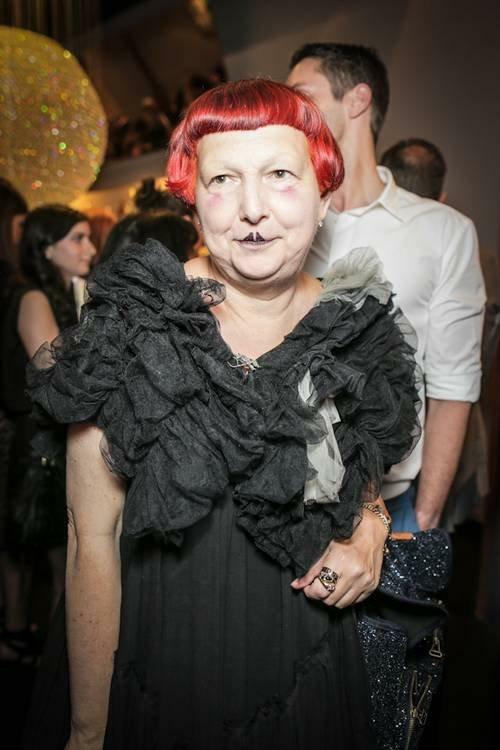 She is known for her eccentric personal style, powdered face and dark, cupid’s-bow lipstick. Lynn recently won first place in the National Society of Newspaper Columnists’ category of humor writing for newspapers with more than 100,000 circulation. You have a very distinctive signature look. 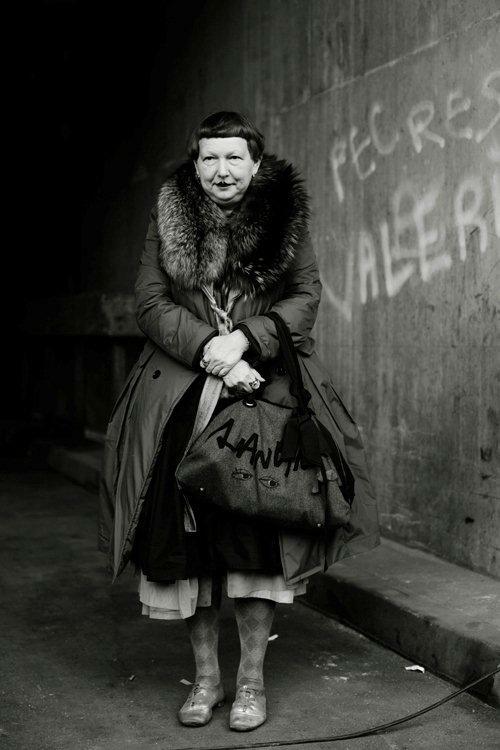 How did Lynn Yaeger become “Lynn Yaeger”? Describe your fashion philosophy. It evolved over the years. It is a very flapper look. Originally, I wore a lot of vintage clothes. I thought that as I got older, I would get more and more conservative, but the opposite happened. It was a way of working out my obsession with clothing and style without actually having to pay attention to trends, because most of the time they didn’t suit me. It’s hard to say how these things happen. It’s a very organic process. I have a two-part style philosophy, and it may seem like the two parts contradict each other but they don’t. The first part is that you should really feel free to invent yourself and wear whatever you want. And the second part is that you should spend a lot of time in front of the mirror to make sure this is the perfect rendering of what you think you want. I really like it when people make a huge effort. You are known for your hilarious observations about fashion and everything that influences it. How has humor shaped your view of fashion? It’s ALL humor! I mean not all, but I really do try to take the long view of the things, see what’s fun about it, and the absurdities. It’s a question that cuts both ways. I think people like to read things that are funny. How do you think you have influenced the New York fashion scene? What are your favorite shopping destinations in New York? I love the Fifth Avenue department stores. I would be lying if I said I didn’t. I love both Bergdorf and Barney’s. I like the Comme des Garçons store. I like the Garage flea market on the weekends on 25th street. I go there every weekend. I’m a really compulsive shopper. I’m in stores all the time. I’m a daily shopper, let’s face it. I don’t buy that much. I feel like I’m there just for the experience. If I only had a day in New York, what are the things I must do? Eating, relaxing, anything. I’m not much of a eater. I would go shopping in the morning at the department stores, and if it was the weekend I would go to the flea market on 25th street. I think it’s fun to just walk around downtown in the Village or Nolita. It’s a great walking town. If you have never been to Century 21, you should go there. What’s your pick for the best fashion people-watching in New York? 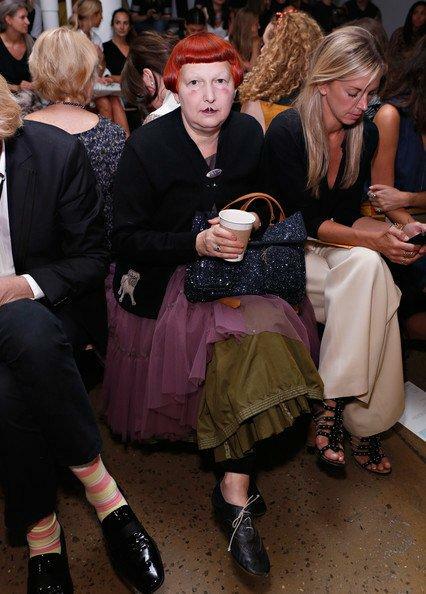 When the fashion shows are on, outside the shows is great, but the whole town is a fabulous array of people watching. It also depends on what you are looking for: Madison Avenue for rich people all dressed up in the latest styles; Union Square for cute kids. What are your must-haves when you travel? Do you have a pre-packed suitcase? I have a pre-packed bag with my cosmetics and miniature toothpaste and things, but I don’t have a pre-packed suitcase. I don’t bring the sort of clothes that seem like they would be easy to travel with – I bring all my tutus and everything, and this is further complicated by the fact that I don’t check my clothes because they are too precious to me. I would have to cram all my clothes into my carry-on, and check the other bag with the things that can be replaced. It’s a bit of a nightmare packing-wise. When I was in Paris last spring, it was really cold and I had my one coat with me. All the Frenchies had their cute little fur coats. I was like: “Damn it! It’s not fair!” I was stuck with the same green coat everyday. I don’t plan my outfits for everyday, but the items I have with me are usually fairly elaborate. This is the most boring answer in the whole world. I like Paris, France. I know it’s ridiculous. I like everything about it: the way it looks, the things you can buy, hearing people speak French. I even like it that the French are so mean — it’s more of a challenge. I also like it when it’s not fashion week, arguably even more. What inspires you when you travel? I like looking at the people when I go to a new city. I travel a lot because I also write for Travel + Leisure. A lot of times I’ll be in the taxi from the airport going to Buenos Aires or Amsterdam, I look out the window and realize I packed all the wrong things – this is how people look and I’ve got this all wrong. I would see people riding their bikes with a big sweater on. And of course I didn’t pack a big sweater. I love to observe these regional differences. How about any favorite travel finds? Tons. That’s what I do. I go shopping and buy things. I had a rule for a while to not buy clothes, only accessories, because I would buy clothes and it would not be the right thing. Lately, I’ve going off that rule and bought clothes, some more successful than others. Lynn Yeager asks some questions…. 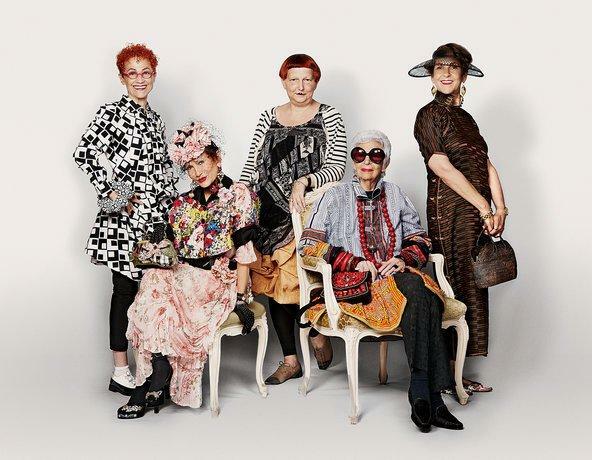 Style Icons Suzanne Golden, Patricia Fox, Lynn Yeager, Iris Apfel and Tziporah Salamon came together for tea and a discussion about their fashion sense…. Lynn Yeager asks the group if there is a time when style failed them. Lynn: “I confess that there have been rare occasions — a business meeting, say, or a funeral — when I’ve looked at my wardrobe and thought, Why, this is a clown’s closet! Did the others ever face a similar dilemma?”Ah, indeed I have, Ms. Yeager, though I did not realize it. I have donned what I considered to be perfectly appropriate attire, only to be hounded by school children hoping to follow me to the circus. I have arrived at business meetings only to realize that metallic green harem pants were undermining my credibility. And in these cases I have watched people’s faces pucker in disdain. Oh yes, I have. What to do if this should happen? Well, goslings, there is a tunnel out of this mess: dazzle them with what you are saying. Trot out the upper echelons of your vocabulary, make eye-contact, and pretend that you feel confident. Of course this only works if you really know what you are talking about (I also have to resist the urge to over-enunciate like Julie Andrews when my back is to the wall). But a few times I’ve been able to pull it out of the fire this way. And it can be exciting to watch someone change their opinion of you as you speak. A workplace can deform one’s sense of style to be sure. An oncologist can’t really wear a sun dress, and you should never see your lawyer’s feet. Lynn Yeager has great advice on this issue. With her extreme, Weimar Republic broken-porcelain-doll looks, Lynn says that in order to look sane when she’s gotta go somewhere and be a journalist, she always carries a very expensive designer bag. En leuk die platte schoenen!!! !